If you’re thinking of cutting your own hair, read this first to make sure you know how to cut your own hair the right way. I know…I know…you think I am crazy. I’m ok with that. I have accepted it long ago, and dare I say, embraced it. 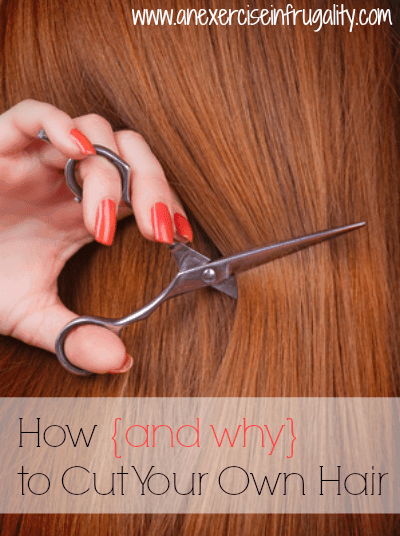 I thought it myself the first time I stood, hair dripping, hand quivering and scissors aloft in my bathroom mirror…but I promise you, the bowl cut horror stories are nothing like my DIY Haircuts. When I was a kid, back in the 80’s and 90’s, perms were all the rage. My mother, bless her heart, gave me several home perms. They never quite worked out right, and I always wound up smelling like a nuclear waste plant. She also cut my brothers’ hair (thankfully I escaped the “buzz cut” fate, but they were not so lucky). I think she wisely avoided cutting my hair at home because she would have had to fumble her way through it, and it would likely wind up disastrous (no offense, Mom!). Nowadays though, there are SO many resources available to teach you how to cut your own hair. Now, I’m not saying that you should take your scissors and start playing Vidal Sassoon and doing crazy styles, but a simple trim, or basic layer cut is easy to do, and think of the money you will save! If you head to the salon every 4-6 weeks for a trim, that adds up FAST. Your stylist may hate me, and I am sure I am gonna catch hell from any hair professionals that stumble upon my post (SORRY!) but hear me out! You can in fact cut your own hair successfully. You can even learn how to cut your own hair with layers! The truth is, they know you can, and that’s why they get so mad when they hear people saying they do their own trims. Now I’m not saying my aim is to put hairstylists out of business, of course a major change is something you might want to consult with a professional on, but a little clean up between salon visits makes a world of difference. My aim is not to have everyone in the world giving themselves haircuts. However–a nice, trimmed hairstyle can make you FEEL better. If you don’t have the money, doing it yourself can provide that boost that you need. Not only the sense of accomplishment for knowing you can do it, but also because your hair looks fresh and healthy! If haircuts for yourself and/or your kids are simply not in your budget, then you can cut your own hair and save that money for more urgent expenses. 1. I am NOT Paul Mitchell, I know my limitations and don’t expect to have a cutting edge fancy schmancy look off the cover of Vogue. HAVE REASONABLE EXPECTATIONS. 2. Do NOT cut your hair while PMSing, or just after a traumatic breakup, or any other time where you might be emotionally unstable. It wasn’t a good look on Britney, it won’t be a good look for you either. 3. Use only VERY SHARP scissors or shears (see below for some great, cheap tools to use). That being said, please refer to tip #2. No stabby-stabby. 4. Do not cut your hair wet. It’s easier to see mess ups right away when it’s dry. Therefore, you can make sure to make adjustments as you go. 5. Speaking of adjustments, TAKE YOUR TIME. Cut slowly little bits at a time. Never hack off several inches at once. You can always take more, you can’t put it back on. 6. Never ever cut straight across. Blunt cuts are for the pros. Blend your snips by cutting “UP”. 7. Do your research. There are TONS of YouTube tutorials that walk you through how to cut your own hair step by step. Find one who has similar hair (length, texture, etc) to yours, and watch that video at least 3 times BEFORE you pick up the scissors. Then have your laptop or computer near by to watch the video for reference. Pause, rewind, repeat as necessary. 9. Be confident…if you’re convinced you will screw up, then you will. Relax, take a deep breath and go. 10. Remember: Hair grows back. If your bangs wind up a little shorter than you’d like, just pin them back with bobby pins, and in a couple weeks they will be good as new. As long as you cut in SMALL amounts as mentioned above, you have nothing to worry about! 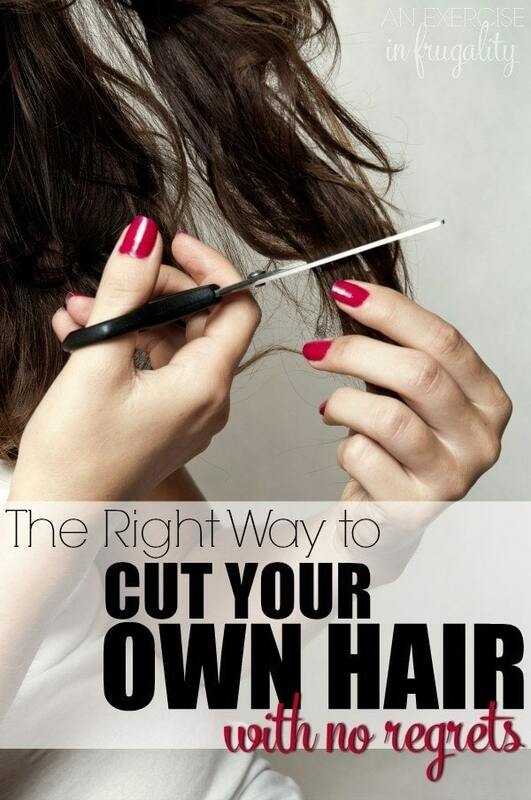 Are you going to attempt it now that you know how to cut your own hair? I’m pinning this for later! 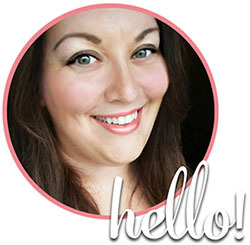 I’ve been thinking about doing my husband’s haircuts – it would save money! Thanks Courtney! I haven’t done men’s haircuts yet (my fiancee shaves his head hehe) but I would think it should be pretty simple! And men get their hair cut frequently too, so it would definitely be worth it cost-wise! Thanks for reading! You are brave! I would somehow screw up my hair. Haha After accidentally going “cartoon orange” while attempting to dye my hair blonde (seriously, think Cheetos) nothing scares me anymore. It’s all fixable 🙂 hehe thanks for stopping by Nina! Jenna, yours probably turn out nicer than mine! LOL I have one basic cut I can do and I stick to it 😉 Lucky you for having the experience though! Ah yes, I am sure we are not the only two scarred by perms of hairdos past 🙂 thanks for reading! I have cut my own hair for awhile due to being told “my hair is not easy to cut” umm. LOL It’s thick and long. Just take scissors to it 🙂 I cut it and donate to Locks of Love though 🙂 I cut the kids hair too, . Melanie, it’s wonderful that you donate! I have done that in the past too, right now I’m growing my hair long for my wedding in August, but I am thinking about going short and donating after that! (A cut I plan on leaving to the professionals haha) Thanks for stopping by! I started cutting my own bangs, then one day I was really bored with my haircut and after a quick research on youtube, I made myself a layer cut! I never stepped inside a hair saloon, because that’s way over our family budget plus after seeing that my mom never got a good cut over the course of the years, made me want to avoid going there myself haha! I started cutting my own hair about a year ago when my mum bought a Crea Clip, free hand I would never of had the courage to cut my hair but with the Crea Clip I find cutting layers easy as it has a built in spirit level so you know your cutting your hair straight. I did cut my hair a little wonky the first time I tried it but then went back and cut a bit more off to resolve the problem and as you say “hair grows back”. My mom did my brothers cuts growing up! Their hair grows SO fast you’d spend a fortune going in every time! My husband does his hair and our sons hair too. I would love to have my husband trim mine too. Its even easier for mens and boys haircuts! I have a friend who taught her husband to dye her hair for her too! No missed spots! I have cut my own hair for the last year! It gets easier every time. I have just started cutting my husband’s hair. My mom cut my brother’s hair for as long as I can remember. I do trim my own and it does get easier! Men’s hair is fairly simple too. Hehe! I agree-money is tight and sometimes my hair grows way too fast. If you’re careful, take your time and only do a minor trim there’s no reason you can’t cut your own! The only person who ever seems to be able to tell when I cut my own is my stylist 😉 And that’s because they have an up close view and a trained eye! I did my own hair for a year or so. I was a little nervous, but it turned out ok. I have curl in my hair, too, so it is easy to hide imperfections. My hair is longer now, and I want to go from a straight bob to more of a layered cut. You’ve inspired me to look for a you tube tutorial for the do I want! I’ve been cutting my own hair for years now. I like it short and choppy so mistakes are easily “hidden”. I don’t like going to the beauty parlor because they pressure me to buy their products (I already use good products) and never give me a good cut. My hair takes 5 minutes to do, sometimes 10. I also let myself go grey. It’s mostly in the front with a little salt and pepper. Love it! Try new things….keeps it interesting.